Brad Henecke introduces open G tuning. First, he explains how to tune the guitar to open G. Next, he teaches some chord shapes and progressions in open G.
Chapter 1: (00:58) Lesson Introduction In this lesson, Brad Henecke introduces you to open G tuning. You may already be familiar with this tuning if you have been following along with Mark Nelson's Hawaiian slack key lessons. When the guitar is tuned to open G, the open strings form a G major chord. This feature provides several advantages. This tuning allows you to play many chord voicings that are not possible or practical in standard tuning. Also, familiar chords produce a different tone when played in another tuning. Open tunings can also help you bust out of a rut. Playing in an alternate tuning will essentially force you to re-learn how to play the instrument. This will hopefully generate some new inspiration and a new outlook on the instrument. Many rock, blues, bluegrass, and folk players frequently play in open tunings such as open G, open D, and open E. Rolling Stones guitarist Keith Richards frequently employs open G tuning. As a result, learning this tuning will potentially allow you to play some of your favorite songs. Chapter 2: (03:15) Tuning to Open G When learning a new tuning, it is absolutely necessary that you start with the basics regardless of your ability level. You must first learn how to tune the guitar to this tuning. If you have a floating tremolo system installed on your guitar, you will encounter several difficulties. When one string is tuned down, the strings on the opposite side of the bridge will go sharp to maintain an equal balance of tension. Consequently, you must tune each string multiple times to ensure that all of the strings are tuned to the correct pitch. Your next step is to learn other fundamental guitar skills in the new tuning. You must learn how to play basic chords, chord progressions, and scales in the new tuning. 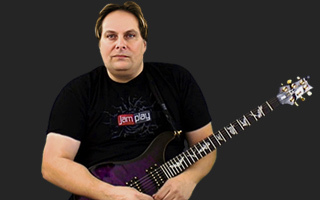 Brad will get you started on the path to learning all of these skills in open G tuning. A specific process must be followed when switching to this tuning to ensure the best and most accurate results. This is also the least frustrating process to follow when tuning your guitar to open G.
Brad assumes that you are using standard tuning as a starting point. 1. Tune your guitar to standard tuning if not already there. Make sure you are tuned perfectly to A=440. 2. Lower the pitch of the sixth string to match the pitch of the 4th string. This note is D. You may find it helpful to match the open D string to the harmonic played at the 12th fret of the 6th string. This will put both D notes in the same octave. 3. Next, match the pitch of the 5th string to the pitch of the open 3rd string. This note is G. Once again, you may want to match the pitch of the 12th fret of the 5th string to the open G string so that both notes that you are comparing are played in the same octave. Pluck both of these notes simultaneously like Brad does as you are tuning. 4. Leave the 4th, 3rd, and 2nd strings in the tuning that they are in (D, G, B). These notes are part of the G major triad. 5. Finally, match the pitch of the 1st string to the pitch of the open 4th string. Use the harmonic played at the 12th fret of the D string to keep the notes in the same octave. You can also use the pitch of the note D at the third fret of the 2nd string as a reference point. 6. Strum an open G major chord across all six strings to ensure that your guitar is in tune. If your guitar sounds out of tune, check back through each individual string that you tuned to see if you made any errors. Note: Since several of the strings are tuned down, you may find that chords are harder to keep in tune as you ascend higher on the fretboard. Chapter 3: (01:50) Chords in Open G Note: Make sure that your guitar is perfectly in tune with Brad's before advancing to the remaining scenes in this lesson. Brad demonstrates your first chord shapes in open G tuning in this scene. By strumming all of the open strings together, an "open" G major triad is produced. It should be noted that this chord is played in second inversion. An inversion occurs when a chord tone other than the root is played as the lowest bass note. In this case, the fifth of the chord, D, is played as the lowest note. When the third of the chord is played in the bass, the chord is in first inversion. When the fifth is the lowest note, the chord is in second inversion. The open G major chord can easily be converted into a movable major barre chord shape. Simply barre the first finger across all six strings to create this barre chord shape. You may want to use the second finger as a clamp to help the first finger hold all six strings down under the barre. In order to transpose this chord anywhere on the fretboard, you must know where the half steps and whole steps occur within the musical alphabet. The root note fretted by the first finger determines the name of each barre chord. This root note is located on the fifth string. The next logical step is to determine where the I IV and V chords can be played in this tuning. This will enable you to play some basic chord progressions and songs. Since we’re playing in open G tuning, the most logical key to start with is the key of G major. You already know how to play the I chord, G major. The IV chord, C is played as a barre across the fifth fret. Then, the V chord D is played as a barre chord up two frets from C at the seventh fret. At this point, determine where the I, IV, and V chords can be played in the remaining 12 keys. This will enhance your knowledge of where notes and chords can be found in this new tuning. Chapter 4: (01:33) Chord Shapes in Open G Needless to say, it will get boring rather quickly if you use the exact same chord shape for all of the major chords. Therefore, you must learn a wide variety of chord voicings in this tuning. You must take the same process of learning chords that you have taken with standard tuning and apply it to Open G.
Brad will run through the major, minor, and dominant chords for A, B, C, D, E, F, and G in order. This gives you a total of 21 new chords to learn. That's a lot to practice! Consequently, you must take your time and learn these chords over the span of a couple weeks of practice. It is easiest to learn and remember chords if you can apply them to a musical context. Make sure that you practice these chords within a progression. Otherwise, you run the risk of forgetting them. Do not be scared off by the process of learning a bunch of new chords in a strange new tuning. As you will notice, may of the chord shapes in open G are very similar to their standard tuning counterparts. Most of the chords in open G tuning typically feature one note that must be fingered differently. This chord can be played as a full barre across all six strings at the second fret. This barre is performed with the first finger. These barre chords in Open G are a little bit more difficult than barre chords played in standard tuning since one finger must fret all of the notes in the chord. The chord voicing that Brad demonstrates looks very similar to its standard tuning counterpart from a visual standpoint. However, the fifth string is omitted from this chord. Also, the pinkie must fret the note E at the second fret of the first string since this string is now tuned to an open D. Due to the fact that this shape contains no open strings, it can be transposed anywhere on the fretboard. The third finger frets the root note on the third string. This note names the chord. Chapter 6: (01:34) A7 Chord This chord is very similar to its standard tuning counterpart as well. Once again, the note E must be fretted at the second fret by the pinkie finger. Similar to Am, the two low strings are once again omitted. However, you can add your first finger to the second fret of the 5th string to add the low root note A to the chord. This chord features an open string. Consequently, if the chord is slid up the neck, the name of the chord will change. For example, if you slide this shape up one fret, a Bb6 chord is produced. You must analyze how the note G functions in relation to each chord to determine the proper name of each chord. For more information about this subject, please refer to lesson 15 from this series, entitled Colorful Chord Tension. This major chord can be played as a simple one finger barre across all six strings at the third fret. This chord uses the same shape as Am. Slide the Am chord shape up two frets to form a Bm chord. The B7 shape is very similar to A7. The first finger must stretch back to fret the note that was once an open string. This note is the b7 of the dominant seventh chord. You cannot add the low root note of this chord, since the first finger must be used to fret the b7 of the chord. The first string is also omitted from this chord. Since this chord shape contains no open strings, it can be transposed anywhere on the fretboard. The note E must be fretted at the 2nd fret of the 1st string in this tuning when playing a C major chord. Also, the bass note of this chord is changed to the open fifth string. This note, G, is the fifth of the C major chord. Similar to the open G chord, this version of C major is played in second inversion. Cm utilizes the same shape as the Am chord. C7 uses the same shape as the B7 chord. The root note of these chords is the open 4th string just like in standard tuning. The voicings that Brad demonstrates for D and D7 omit the third of the chord. As a result, the chord demonstrated for D major is technically a D5 power chord that can be substituted for either D major or D minor. However, the third of the chord can be added by fretting the note F# at the 4th fret of the first string. The Dm chord requires that you fret the third of the chord (b3) at the third fret of the 1st string with the pinkie finger. Otherwise, this chord is the same in standard tuning. The E chord no longer uses the two lowest strings. Also, you must fret the high root note at the 2nd fret of the 1st string with the third finger. To switch from E to Em, simply lift up the first finger to lower the major third of the chord by a half step. To switch from E to E7, simply lift up the third finger. The pitch of the open first string is D in this tuning. This note is the b7 of the E7 chord. The F chord shape in open G is a movable voicing with the root note located on the 4th string. Notice how the pinkie finger must fret the high root note at the 3rd fret of the 1st string. Otherwise, this chord shape is very similar in standard tuning. The shape used for Fm is pretty strange. It only involves the three treble strings. You can think of this chord by comparing it to the shape of the open Dm chord in standard tuning. However, the third of the chord, which is located on the first string, must be moved up by two frets. Consequently, the pinkie finger frets this note. This is a movable voicing. The root note is fretted on the second string. The voicing for F7 is completely different in this tuning. It features a barre from the fifth string down. This is a movable voicing. Keith Richards uses this shape very frequently when playing dominant chords in open G tuning. You've already learned the basic open G chord in this tuning. This chord is played by strumming all of the open strings. Gm is fairly unusual from a visual standpoint. The third and fifth of the chord are fretted at the third fret on the 3rd and 2nd strings. By adding the note F to an "open" G major chord, a G7 chord is formed. The note F is located at the 3rd fret of the D string as well as the third fret of the first string. Adding either of these notes or both of them will convert G major to G7. Chapter 12: (01:18) Open G Chord Progression Brad teaches you a chord progression and strumming pattern that can be applied to this tuning. Remember that it is easiest to remember new chords if you apply them to a musical, practical context. The progression begins with an open G chord. The next chord is Em. Then, the progression moves to B minor and finally back to Em. Use straight quarter notes as you first begin to strum this progression. A D7 chord enters after several repeats of this chord progression to serve as a strong transition back to the tonic chord of G major. Note: Tablature and notation to this chord progression can be found under the "Supplemental Content" tab. interesting, but kinda useless, as it means relearning the guitar. I'm still trying to learn the basic tuning. Why not show some Keith Richards songs, the king of modern open G? Almost all his greatest riffs haven been in open G since he started using it in about 67 , Honkytonk Woman, Brown Sugar, Tumbling Dice, Start me up and on and on. Question: why is the B on the 3rd and not 4th? Yeah, I reckon you're right there. In the Supplemental, the B major chord is a barre of the third fret, whereas it should be the 4th. The other B shapes look okay. Just a few more observations about the supplemental content... For the B7, the 1st string should also be muted (or not played). For the open D and D minor shapes, these should be moved up a fret, such that the D note on the 2nd string is on the 3rd fret, not the 4th. (The D7 is okay.) For the F minor chord shape, would it not be better to also fret the F note on the 3rd fret of the 4th string, just as has been indicated for the other two F chords? This would still be moveable, and would not require the 4th string to be muted / not played. I'll update these when I get a chance today or tomorrow, thanks for pointing it out!